PDST Technology in Education is based in the INVENT Building on DCU campus. Our offices can be reached both by Ballymun Road and Collins Avenue. Collins Avenue is a much shorter walk. There is a pedestrian walkway from the Collins Avenue entrance to the INVENT building. 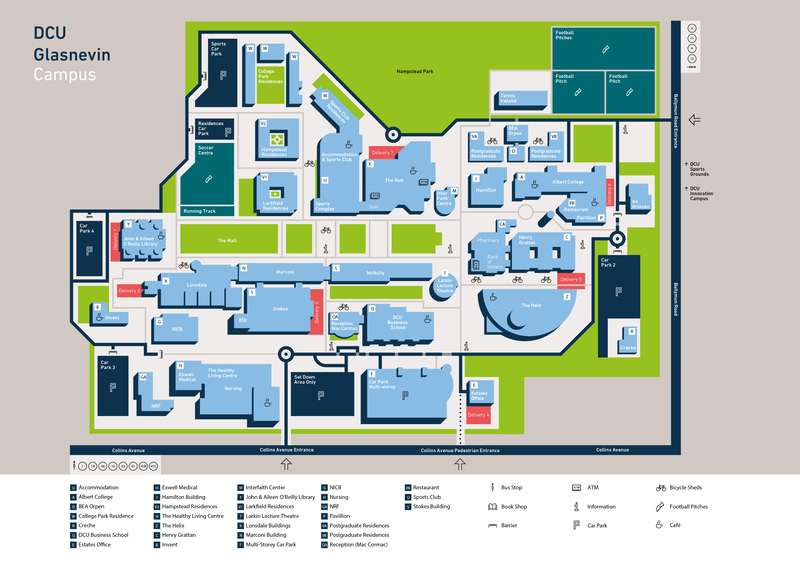 If you require car parking, you must enter DCU via the Collins Avenue entrance and use the multi-storey car park 1, which is a paid parking area. The INVENT building can be accessed using a pedestrian walkway past the School of Nursing and Chemical Science building. If travelling by car for the purpose of deliveries/collections, enter DCU from the Ballymun road entrance. Follow the road round to the very end. There is a car park behind the INVENT building but this is restricted for staff access. How do I get to DCU? By car - approx 10 mins. Follow the M1, direction city centre, and turn right at Whitehall Church into Collins Avenue. DCU is 500 metres on the left hand side. Number 104 departs from Clontarf DART Station and the Omni Shopping Centre. Number 105 operates from Malahide and leaves DCU at 15.40 and 17.20 during term time. Numbers 11 and 11A service the city centre and Kilmacud from Wadelai Park and stops in O'Connell Street. The 11B also services the city centre and Belfield from Wadelai Park. The 13A services the city centre and Merrion Square from Poppintree. The 19A services the city centre and as far as Limeklin Avenue from Jamestown Road. Number 116 services DCU to Ballinteer and Clonskea. Numbers 46X and 58X (zone 2) run from Leeson Street Lower to Dublin Airport. Number 77X runs from Jobstown to DCU, however there is no departure from DCU. Bus routes 44 & 104 stop directly outside The Helix, within DCU campus grounds (it is approx. a five minute walk to from here to PDST Technology in Education). Ask the bus driver to let you out at Whitehall, and then walk 10 mins along Collins Avenue to DCU. The nearest Dart stations to the university are Clontarf and Killester. They ensure that the university is accessible from all areas on the Dart line, including those south of the city. These two particular stations are regularly serviced by the 103 bus which stops on Collins Avenue. From south east (N11) use Eastlink, East Wall Road, Clonliffe Road, Drumcondra Road. Turn left at the Whitehall/Collins Road junction and DCU is 500 metres on the left. From other directions around the country, use the M50 (including Westlink if applicable). Come off the M50 at the Ballymun exit (Junction 4) and drive through Ballymun, turning left at the Collins Avenue/Ballymun Road crossroads (approx 500 metres). DCU and the multi-story carpark is 200 metres on the right on Collins Avenue. Follow the airport road which takes you through Drumcondra and turn left at the Whitehall/Collins Avenue junction. DCU is 500 metres on the left. It is also possible to drive through Phibsborough towards Glasnevin, turning into the Ballymun Road. DCU is on the right hand side of the dual carriageway, but you will need to drive further on to the Collins Avenue/Ballymun Road junction and turn right in order to avail of the multistory carpark (DCU is 500 metres on the right). Route 44 operates between DCU campus (beside the Helix) and Enniskerry via City Centre (O'Connell Street) M-F.